Vacation Rental or Holiday Villa in Antiphellos/Kas,Cukurbag Peninsula,Lycia, An. Late Deals, Special Offers. 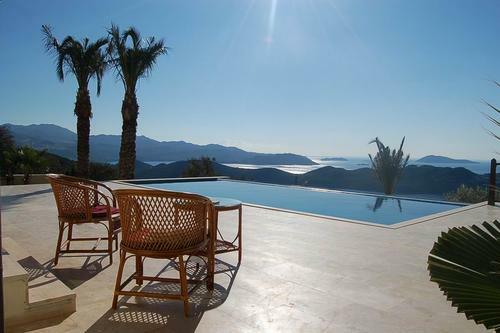 Villa Babs with panoramic Mediterransea views in Kas Turkey. Vacation rental. hammock, large suspended seating area, and sun loungers. bedroom accommodation, and steps leading down to the spacious open plan living room. screen TV. Area 2 with 2 large sofas either side of French doors leading directly onto the pool terrace. dishwasher, gas hob, electric oven and hood extractor. �	Separate utility room with washing machine. �	Circular dining area with sea view window. �	Spacious ground floor cloakroom with WC . bath set in a sea view recess. into sea view window recess. �	Large family bathroom with circular bath and separate shower cubicle. �	Twin bedroom with 2 single beds and fitted wardrobe. �	Welcome pack of local produce on arrival at the villa. �	Daily fresh bread delivery. "Come to Kas a visitor, leave as a friend". Kas is located on one of the most beautiful & unspoilt coastlines in the Mediterranean, with its clean air & unpoluted crystal clear sea with amazing visibility it is very popular with the diving & sailing fraternity. There are 2 pebble beaches and sea swimming platforms near to the villa. In a region steeped in history it has a myriad of archialogical sites close by. Due to an influx of designers & artisans Kas has become a centre for arts, crafts & antiques, with some of the best shops, restuarants, harbour bars & tea gardens on this part of Turkies mediterranean cost. Tranquil by day, by night Kas's quaint cobbled streets & harbour comes to life, with shops staying open to past midnight, the bars & restaurants much later. It is the perfect base from which to explore the local historic sites & beauty spots, to particpate in adventure sports i.e. para-gliding, white water rafting,jeep safaries, mountain walks or to just chill out & indulge in hedonisic pursuits. Public transport on the peninsula to & from Kas is by Dolmus [8-10 seater mini bus] for around 50p which runs hourly day and night. There are regular bus services that run out of Kas to Kalkan, Fethiye, Antalya and any other areas you may wish to visit, fares are cheap. Local fisherman provide water taxis to local beauty spots & secluded bays. Price Includes:-N.B. prices apply to full occupancy for parties up to 6 persons, an additional 2 persons maybe accomadated in the studio apartment at a s weekly surcharges of �100.00-�300 apply, please enquire Discounts may be available for 2 persons only occupancy. PLEASE visit our WEBSITE for further details at www.kas4villarentals.com or e-mail us. Prices include weekly cleaning,white linen,bath & hand towels changed weekly,,sun beds and parasols by the pool. Welcome pack of local produce. Price Excludes:-Flights,Airport transfers,car hire and taxis unless oherwise specified. Guests must provide their own beach towels for use around the pool. Other Information:-We can provide all your airport transfers and car hire requirements when booking your holiday. PLEASE ASK ABOUT OUR COMPETITIVE CAR HIRE & TRANSFER PACKAGE.